The Nordhavn 59 Coastal Pilot is entering its final phase of work at the factory and is anticipated to ship around the end of this month. Hull #1 was recently launched into the test tank with stellar results, notes Vice President of Pacific Asian Enterprises (PAE) Jim Leishman. Pacific Asian Enterprises (PAE) partnered with Turkish yacht brokerage Emek Marin in 2013 to serve as its Nordhavn representative in the Eastern Mediterranean. There’s no denying the love people have for their pets. You don’t have to dig deep online to discover the crazy (sometimes disturbing!) lengths people will go to keeping their pets happy. 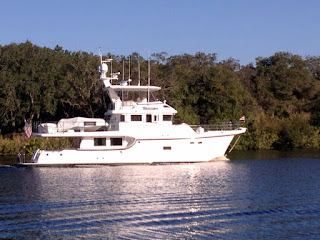 This month’s featured owner’s blog comes from the owners of Nordhavn 60 Blossom.